Born on the border of Kentucky and Tennessee, Nick Lachey and his younger brother, Drew, excelled in sports and academics while attending Cincinnati's School for the Creative and Performing Arts. While there, the brothers honed their vocal abilities, but it wasn't until Nick was a student at Miami University in Ohio (where he was studying sports medicine) that he found himself seriously considering a career in music. He and soon-to-be bandmate Jeff Timmons were invited to attend auditions for an up-and-coming vocal group in Los Angeles. Drew and pal Justin Jeffre jumped aboard shortly thereafter, and the boys band 98° was suddenly formed. The group went on to release four albums (all of which went platinum), and singles such as "My Everything," "Way You Want Me To," and "Give Me Just One Night (Una Noche)" became chart and radio favorites across North America. During the band's run, Nick fell in love with one of the group's opening acts — singer Jessica Simpson. The couple would marry in 2002 as Lachey went about launching his solo career. One year later, he released his debut solo release, "SoulO," in addition to joining his new bride in the wildly popular MTV reality series, "Newlyweds: Nick and Jessica," which went on to air for four seasons. 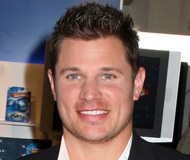 When the couple eventually split in 2005, Lachey had already cemented himself as one of the industry's top rising stars.